Here’s an experience we’d like to relate to anyone thinking about ordering custom dry transfers from us for the first time. If you don’t know how easy it is to work with us, Maude Paquette-Boulva can probably tell you. Maude is a graphic designer at a creative agency based in New York City called “214”. Chris Dowling, co-president and creative director of “214”, describes the agency as “using strategic, impactful design to drive brand love across digital and retail channels”. 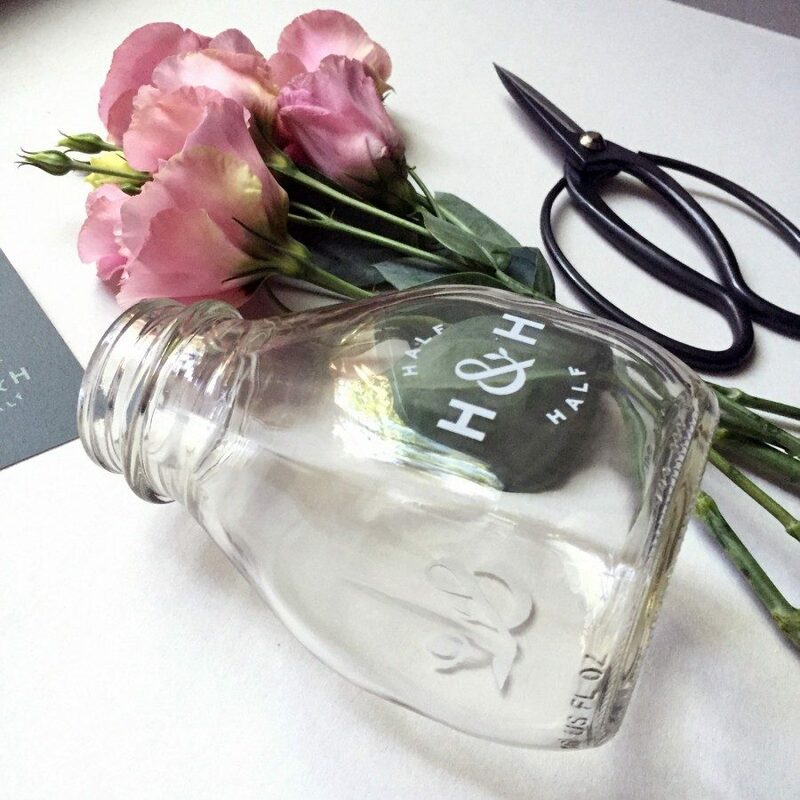 One of their clients, Jennie Wolfe of Half & Half flowers, needed marketing photos for their company’s website launch but her product was still in production. The solution was to create product prototypes. Maude uploaded vector artwork she developed for rubdowns on glass and ordered white dry transfers from Image Transfers. Take a look at the beautiful photos that transpired just in time for their website launch. At the age of 9, I handmade my first bouquet from a raging patch of wild flowers carefully hid on the side of the house in my mother’s competition-ready landscaped yard. I cut and arranged the flowers in my grandmother’s crystal vase and placed them on the dining table with a sweet note to surprise my mom. Unfortunately, my gesture came with a ton of bugs and sent my mom screaming. 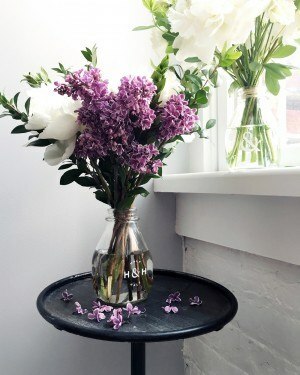 I learned from that young age that flowers and a thoughtful note have the ability to transform a space and your mind. Bugs, not so much. Flowers give life to a room until their beauty fades reminding us not to take anything for granted, flowers also teach us that caring and nurturing makes things last longer; two simple lessons important to remember. Throughout my life I’ve realized kind thoughtful words and reminders help me have the courage to live my truth. And by following my heart and challenging myself Half & Half Flowers was born to be a beautiful reminder to all of us to live life as true to ourselves as we possibly can. We support and encourage small business startups like Half & Half. From answering questions about “ganging up” artwork to maximize the amount of rub-on transfers that can fit on a page, to tracking shipments, we get great pleasure from helping small business owners like Jennie; as much as we like helping our regular customers like Maude from 214. Custom dry transfers are perfect for creating realistic looking prototypes. From your vector-based artwork we can match any custom color. Besides custom colors, clients can choose from the Pantone Graphic Palette, Crown Roll Leaf Foil Palette or even the Kurz Foil Palette. Drag & drop to upload your artwork right on our website. With a normal turnaround of 24 to 48 hours to get them to your door, our rub-down dry transfers will be in your hands to complete your project very quickly. With our transfer service, clients can have a finished product prototype that looks exactly like what their company will be producing, way before the production line is complete. Having a finished product prototype allows our clients to “have all their ducks in a row” for their media campaigns, from professional photos, brochures & marketing material, visuals for press releases, and resources for website development, all of this was done with the help of our custom dry transfers, so they are ready to start the important task of promoting of their products. Take a close look at the detail in these photos. Our custom transfers for glass are clean and crisp; the edges are invisible to the naked eye. After being applied, our client’s vector art looks like it’s been printed right on the substrate. Our custom dry transfers are perfect for glass applications because our adhesive is only on the image area, leaving no adhesive residue. Applying our rubons is really easy. You just need to rub them down with the burnisher tool that we provide. We hope you will check out Jennie’s company at www.halfandhalfflowers.com and spread the love with local flowers. We wish Jennie much success and thank her and Maude for using our services. 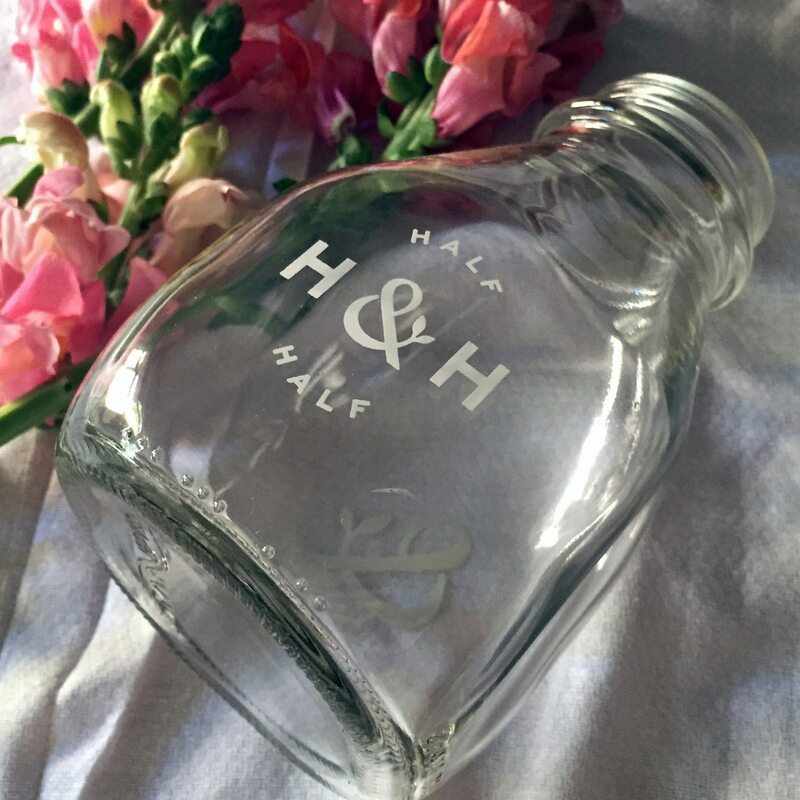 I am looking for a custom decal that can be applied to some of our gift shop items, mainly some new glass drinking bottles we just got in. Will your product adhere to glass, how long will it remain in tact, and what will happen if the glass gets washed? Also how much would it be for 48 2″x2″ decals? Gregory, Our transfers can certainly be applied to glass (like the visuals here for the flower shop) but we would not recommend them for drinking glasses. These glass vases were prototypes to represent the vases the company would eventually produce. They were created so photos could be done in time for the website launch. The transfers are lacquer ink with lacquer adhesive so they would probably stand up to washing but our product is not recommended for any items used for food consumption. You might want to check into pad printing. Although not as clean as a transfer I believe it is a permanent solution used for the type of project you are detailing. Thanks for getting in touch!